Chef Ash Elmenshawy plates a slow-roasted brisket at Lemon Mediterranean Restaurant in Freehold. The menu at Lemon Mediterranean Restaurant brings together a variety of cuisines, including Italian, Spanish, French, Moroccan and Greek. Dive into one of the restaurant’s signature Sicilian rice ball dish that’s stuffed with mozzarella and green peas covered in a roasted garlic tomato sauce. Chef Ash Elmenshawy also hosts monthly cooking classes in the restaurants if you’re looking to learn some new skills in the kitchen. For more information, call 732-761-0900 or stop by at 3475 Route 9 N.
Rice Balls in the Top 23 Best Bite Foods in the Country! As you enter Lemon Mediterranean Restaurant, you feel as if you are walking into an oasis right off Route 9 in Freehold Township. What a surprise awaits as you leave the busy parking lot of the strip mall and head into the restaurant. The soothing tan walls are decorated with replicas of violins, copper pots and mirrors, with the tables beautifully set with mint green and white cloths. You truly feel as if you have left your busy life behind. And then chef and owner Ash Elmenshawy greets you — like a long-lost friend. “Chef Ash” walks around his restaurant greeting old and new customers alike. Everyone is made to feel welcome. But the best welcome is the food. Elmenshawy was a lawyer in his native Egypt when he decided to leave and come to the United States. He no longer wanted to be a lawyer. So on Dec. 31, 1988, he said, he found himself in New York City’s Time Square, celebrating New Year’s Eve. After that, the self-taught chef worked a variety of restaurants, starting at the bottom and working his way up. 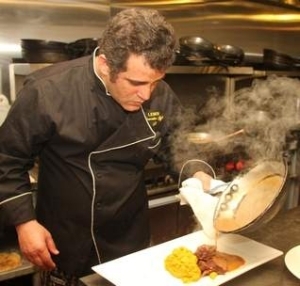 Before opening his own restaurant, he worked in La Cipollina in Freehold and many other restaurants, learning his craft. In addition to Lemon, Elmenshawy owns Ginger Indian Buffet and Hummus Mediterranean Restaurant in Freehold. Elmenshawy said he was given a lemon tree as a gift by a customer and when he opened his own restaurant, he decided to call the restaurant Lemon. As you look over the menu, nibble on the complimentary creamy house-made hummus and warm pita — a specialty. Don’t fill up too much though, you need to save room for all to come. To start, try the Sicilian rice balls stuffed with mozzarella and green peas with a roasted garlic tomato sauce ($7), or the fried feta cheese zucchini cakes with onion, fresh herbs and dill with Greek yogurt ($8). Then have a salad, fresh and light. The farro salad has sundried tomatoes, capers, olives, sweet peppers and feta cheese in a sherry wine vinaigrette ($8). The pistachio goat cheese salad is made with mixed greens, red onions, mushrooms and balsamic dressing ($8). Entrees include rack of lamb in a port wine reduction with cranberry polenta ($29); Branzino, a Mediterranean sea bass roasted with grape tomatoes, garlic, fresh thyme and grilled lemon ($27), and hanger steak au poivre with a peppercorn brandy Dijon sauce and grilled lemon-roasted potatoes ($23). Desserts — if you have room — include warm caramel covered dates with vanilla ice cream, cranberry white chocolate bread pudding and Mediterranean baklava; $8 each. Elmenshawy said he believes in quality, freshness and cleanliness for his restaurants. Though Elmenshawy is very hands on, he said he decided that when he had his own restaurant he would be in front, talking to the people. And in the front he is, going from table to table, talking to his customers. “I like seeing people happy when they eat my food,” he said. Lemon Mediterranean Restaurant is at 3475 Route 9 N. in A&M Plaza in Freehold Township. Call 732-761-0900 or visit http://lemonfreehold.com/. Chef Ash holds monthly cooking classes in the restaurant. Visit the website for details. Visit the original Asbury Park Press Special Feature on Lemon Mediterranean Restaurant.